This is a 5GB data bundle allocation available for use between 12am and 6am every day. This bundle will be charged at Ksh39 daily. Customer can purchase the bundle more than once. 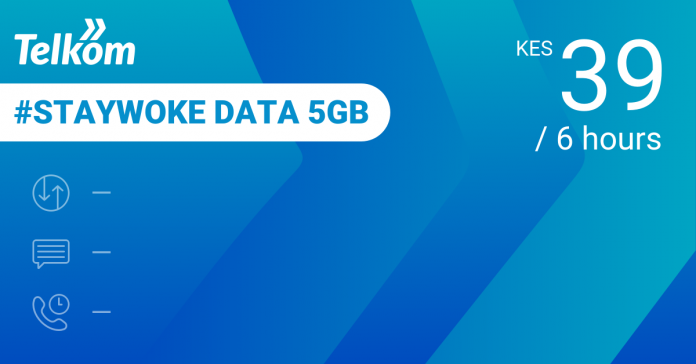 The 5GB data will be available on a use it or lose it basis. The data bundle cannot roll over. The data bundle cannot be used outside the 12am-6am time frame. The data offer is available to all prepaid GSM customers on the Tujuane profile. Customer can subscribe to the offer by dialing *544#,recharge portal www.myaccount.telkom.co.ke and mytelkom app. Dial *544# from your mobile phone or tablet. Go to ‘My Telkom” app and select the #StayWoke data bundle to subscribe. Go to ‘www.myaccount.telkom.co.ke’ on your browser. The data bundle allocation is 5GB. Data bundle will be available for use between 12am to 6am. Customer can subscribe at any time of the day but will only be able to use the data between 12am-6am. Customer can subscribe more than once. If the customer runs out of #StayWoke data bundle allocation, he will access data at a out of bundle rate of Ksh 4.30 per MB.